Saves Wood and Saves Money! 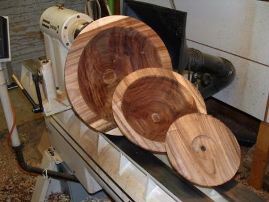 Coring bowl blanks is a way to produce more than one bowl from a single wood blank. It does require some type of coring tool. There are a few different ones on the market, from hand held models as simple as the Robert Sorby arm brace tool for which you can purchase a straight and thin slicing attachment up to what I am currently using which is the “Oneway Easy-Core” system. 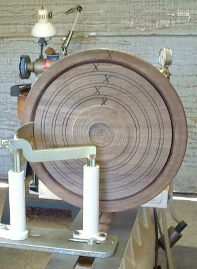 On my “Oneway 2436” lathe there are four curved knives and fingers or supports which allow me to retrieve bowl blanks from nine to eighteen inches in diameter from one woodturning blank. Another feature is the cutter itself is removable to allow them to be sharpened or they may be purchased separately, unlike some other systems. 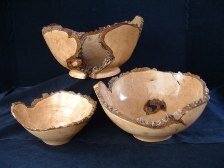 This nesting set of three natural edge black cherry burl bowls were also cored in this way. If you are selling your work these nesting bowls would be set at a higher price than individual bowls. If you’re looking for a fast, money saving way to produce more products from the same amount of wood, coring is the solution!